Optimizing online conversion is tricky. Sure, measuring conversion rate is straightforward enough: Typically, the number of visitors who completed the desired result (usually, a purchase), divided by the total number of visitors. However, optimizing conversion is a whole different ball game – one that requires in-depth understanding of the process leading up to conversion. Many think of this process as wholly dependent on the merchant. By recognizing and optimizing for the motivations behind conversion, and carefully orchestrating all touch point factors to work in unison, conversion rate is sure to soar. However, it takes two to tango: Site visitors’ ultimate decision to convert originates long before they even visit a merchant site. The path to conversion begins once a visitor develops – and acts on – their intent. In a nutshell, intent is what the visitors set out to do when visiting your website. When it comes to eCommerce, that intent should ideally be to make a purchase, whereas for another type of website it could be totally different (e.g. a sign up in a Social Media site). Focusing on eCommerce, whether the visitor’s intent is to purchase or to browse could mean the difference between a quick conversion, a delayed conversion and even a missed-conversion. Surprisingly, intent is one of the most under-referenced terms in online marketing, when it should be central to the process of building a website, and particularly its conversion funnel. Often, when websites have healthy traffic and low conversion rates, we’ll find that something is off when it comes to intent. Either the site is targeting (via SEO, SEM, and Social Media) an audience that exhibits low or no-intent, or the site itself isn’t structured in a way that appeals to visitors with intent to buy. Wherever the gap, visitors aren’t buying it – literally. Imagine how much more effective your website would be if it excelled at capturing and holding the attention of the right visitors. Visitors with the intention of converting, in the first place. Your acquisition costs would drop, while your conversion rate and ROI would spike. You’d even see better SEO rankings due to user behavior indicating higher relevance. Luckily, there are ways to identify intent very early on in the user funnel. Search engine users typically fall into three categories: Navigational, informational and transactional. The first group is composed of users trying to navigate to a specific website; the second are attempting to find information. The third and final group is the one eCommerce merchants should be very interested in: They’re looking to buy. Individuals in the third group are the ones driving most online conversion on eCommerce websites. Members of the first two groups tend to sift through sites like catalogues, in the hopes of finding something that catches their attention. Though individuals in all categories could end up converting, the likelihood is much greater among the third group. What’s more, they’re likely to convert quicker. The main difference between the groups is not demographic, it has nothing to do with age, income or device; it’s about intent. Search Signals – Are You Paying Attention? Visitors with shopping-intent can be identified early, by their searching behavior. This refers both to the search they conducted in order to get to the site – assuming they went through a search engine such as Google, and didn’t type the URL directly – and the searches they conduct within the eCommerce site itself. Users signal intent by the keywords they use, the frequency with which they search, and even the results they select to view. Accurately deciphering search behavior is key to identifying intent, since it can then be nurtured in a way that optimally facilitates conversion. When using a search engine, users with high transactional intent will typically either use exact product names, indicating that the research part of their decision-making has already taken place, or they’ll use last-step terminology, such as “coupon”, “buy”, “discount” and “free shipping”. These keywords, along with a product name or category, indicate that the purchase decision has been made, and now the only thing left is sorting out the details. Conversely, users with informational intent are more likely to use descriptive words like “best”, “compare” or “reviews”, whereas users with navigational intent typically enter brand/site names in addition to a category or product description, e.g. “Amazon”. Since the majority of web content is informational, it’s easy to see why search behavior developed to so clearly distinguish between users with differing intent. Once within a website, search behavior changes significantly. Contrary to what one would assume, popular search queries within websites are not necessarily the most popular queries used on general search engines. What’s more, site search queries tend to be shorter. Despite the discrepancy, it’s safe to say that site searches are a vital part of eCommerce conversion, and a strong signal of purchasing intent. Naturally, eCommerce site owners will want to zero in on one particular type of intent, and that’s purchasing intent. To nurture this intent, it’s important to structure the website in a way that facilitates this end goal seamlessly and intuitively. Think of it as giving your visitors precisely what they want: A fast way to fulfill their intent. Typically, this starts with a simple-to-use site search functionality. The more advanced, the better! Opt for one with synonym search, Natural Language Processing, and Auto-Complete capabilities to ensure your visitors get the most relevant results every time, and reach the checkout page quicker. compared with visitors who navigate using categories or even promotional link-banners. 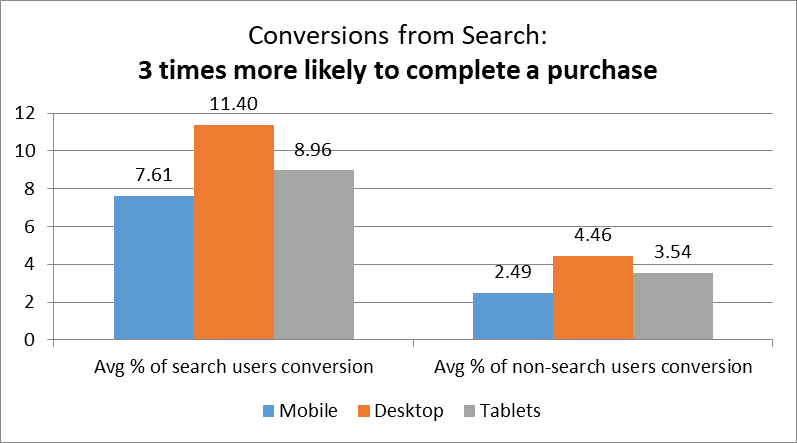 search users being about 2.5X as likely to convert on desktop and tablet, and 3X on mobile. When it comes to mobile, eCommerce conversion tends to be lower than on desktop or tablet. However, don’t write it off just yet, since mobile is slated to account for 45% of all conversion in the US by 2020. This gap in conversion could be explained by the smaller screen on mobile devices, making it harder to examine products and input personal details, compared to the typical desktop or laptop screen. Mobile users seem to make up for this, however, with a higher tendency to use site search. Similar to desktop, their use of site search leads to a higher likelihood of conversion. 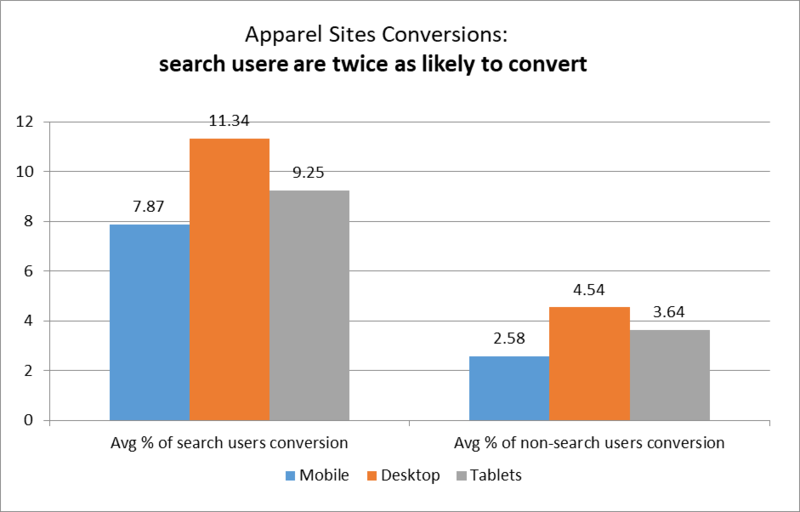 This further emphasizes the cruciality of friendly, effective and intuitive site search to conversion, on any device. Site search doesn’t only indicate an intent to buy – it can actually stir up such an intent. This typically happens when browsers (visitors with low or no intent) who couldn’t initially verbalize their intent, stumble upon something that can be verbalized, like a brand name or an item description. This then prompts them to begin searching actively, and develop intent. There are numerous possible reasons behind the higher conversion rates measured among site search users, but it’s likely that, to begin with, shoppers who use site search exhibit an intent to buy. Once this intent is put into words, shoppers are led quickly to what they need. Often, this means that they’re not necessarily shopping for ‘coats’ – they’re interested in products that meet a more narrowed down description, such as ‘red hooded parka’, or “sale trench coat size 6”. With a sophisticated site search, they can get to what they need and checkout in no-time. If your site search did its job, the next item on your list to tackle is your checkout process. This process should be as painless and as predictable as possible, collecting the necessary information securely and clearly communicating to the visitor what to expect in terms of fulfillment. Predictability is key – when a process isn’t intuitive or ‘normal’ it can cause confusion, which is terrible for conversion. Checkout is also an excellent opportunity to lay the foundation for customer loyalty. A good experience doesn’t start when the customer receives the product they purchased, it starts when they first make the decision to buy it from your website. Finally, once central intent keywords are identified, merchants can embark on a process of intent-based Search Engine Optimization, with the goal of creating landing pages for top keywords. These landing pages would serve to funnel visitors through precisely what they need, instead of going through the homepage or a particular product page. These landing pages should also include the option to search the website as a whole, much like the homepage and product pages. Simply put, an eCommerce website that isn’t optimized to tap into visitors’ purchase intent is leaving money on the table. By providing a seamless experience that understands the customer’s emotional state when searching, clicking, browsing and checking out, merchants can increase conversion and loyalty in the short and long term. Intent is real, measurable, and impactful. Are you turning your visitors’ intent into revenue?